What to do on Gudi Padwa? - Marathi New Year - How Is Gudi Padwa Observed? Gudi Padwa is the Marathi New Year as per the traditional Hindu Marathi Lunar Calendar. 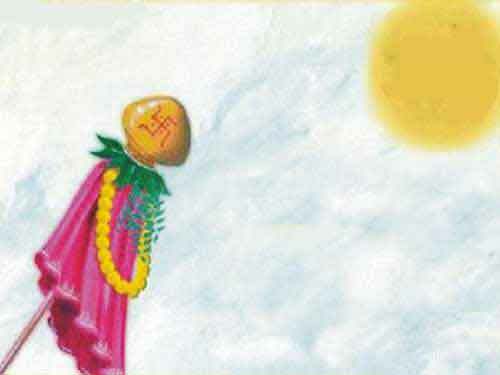 Chaitra is the first month in the Marathi calendar and Gudi Padwa is observed on Chaitra 1 or the first day of Chaitra. Two important things people do on the day are the erecting of Gudhi and sharing of a mixture of neem and jaggery. The astrological predictions for the year known as Samvatsar phal is also read on the day. Here is a brief idea on how to observe Gudi Padva. People get up early in the morning of the Gudi Padwa day, and after bathing and morning prayers; erect Gudhi – the hoisting of flag on a bamboo staff. The flag hoisted on Maharashtrian New Year is made of green or yellow colored silk cloth. A bright garlanded goblet or pot is hung on top of the flagpole. Symbolically, the raising of the Gudi means empty your ego, take an inverted look within, hold yourself up to the vast sky of divinity and may your soul remain outdoors, away from the trappings of this world. Lord Ganesh and Goddess Saraswathi are worshipped on the day. Marathi Panchang is read on the day especially those pages with the lunar year predictions. In some regions a mixture of jaggery and Neem leaves is shared among family members, neighbors, friends and relatives. Some people make a paste out of neem leaves, hing, salt, cumin seeds, owa and jaggery and share it. The most favorite dish in the local region is prepared and offered to gods and it is shared after the puja. People also exchange sweets among friends, relatives and neighbors. The Gudi is removed after the sunset on the day.